My new year 5 team and I sat down to plan together for the first time last week. Our class novel is Cosmic by Frank Cottrell-Boyce and the teachers decided they were going to focus on character both in reading and writing lessons. 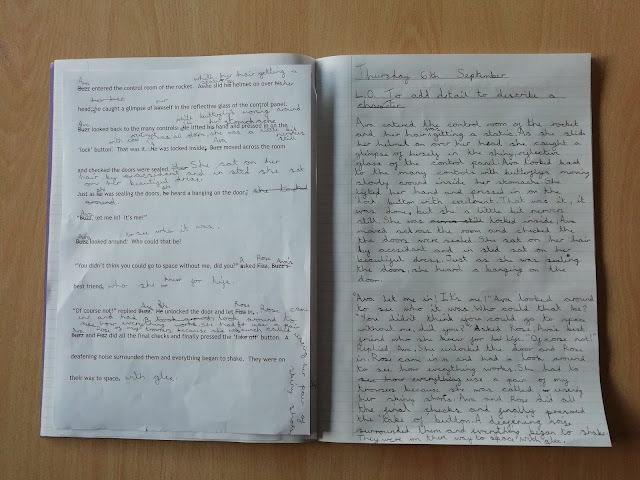 With a view to having children write their own piece of narrative involving a character of their own invention we set about planning how we would teach them to introduce their character to the reader. I have lost count of the number of times I've taught children to write character descriptions but I know that every time I've done it there has been a niggle. A paragraph describing what a character looks like and what they like is not something we come across that often in the books we read. I have seen numerous requests from teachers for passages from books which contain good character descriptions and whilst there are some out there, I haven't noticed it to be that common, especially not for a main character,. So, my team and I discussed how we might teach children to write about their characters in the way a real author might. Looking at Cosmic we found that information about Liam's character was scattered throughout the first few chapters. To begin with, the information about his character is explicit, then the information becomes more implicit, then, crucially, no new information about his character is given - all his actions, thoughts and feelings for the rest of the book are congruous with the character that has been introduced in the first few chapters, apart from instances of the events of the story changing an aspect of his character. I don't know if that's how Frank Cottrell-Boyce planned it to be, but that's certainly how it seems to have panned out. I suppose what we were looking at teaching was characterisation - how a writer portrays their character. In Cosmic we found examples of both direct and indirect characterisation but what we didn't find was a big chunk of direct characterisation, which is what children are often taught to do (which is probably fine at an earlier age). Our first port of call was to read the book in order to be inspired both by the character and by the organisation of the text. Reading lessons focused first on retrieving information about the characters (as well focusing on the all-important vocabulary that is foundational to understanding how characters are being described). They then moved on to being focused on inferring information about the character based on their actions. Examples of these comprehension questions can be downloaded from my TES resources page. These, and the accompanying book talk (discussion), gave the children the chance to see how authors pepper the text with carefully-placed pieces of information about their character. Next came the task of developing characters for their own stories. This was done in the usual way - nothing too innovative or fancy here - if it ain't broke, why fix it? Children drew their characters and annotated them with phrases that they wanted to use to describe them. It was the next part that was going to be difficult. How were we going to get children to use the information about their characters in a piece of narrative without writing up as one paragraph of character description? We decided to focus on one thing at a time: the inclusion of descriptive phrases and not the creativity that would have had to go into writing a piece of narrative. To achieve this, one of the teachers wrote a short piece of narrative devoid of any description, direct or indirect, of the characters mentioned. She double-spaced it and provided a copy for each child. The children then edited the piece to include, in relevant and suitable places, phrases of description of their character. An example of the provided narrative and the edits made in an attempt to add character description. At the point of writing this children have had a first attempt at completing this activity. After reviewing a few books it would seem that the children need to revisit their original characters, develop some more details and then ensure that when they edit the narrative that they have included the information that conveys to the reader what their character is like. For example, one child's character is a snail, but nowhere has he mentioned its shell, its tentacles (yes, apparently that's what they actually are) or its single, slimy foot. All children have also missed the opportunity to add a direct piece of description after the character catches sight of their reflection in the control panel - this will be a simple, whole-class starting point to modelling how they might further include character description in the narrative. What Do Authors Say About This? But what do I know? I've only read a load of books. So I asked a few people who've actually written books how they go about describing their characters. Their replies provided food for thought for further lessons (bring on PPA!). Lisa Thompson, author of The Goldfish Boy and The Light Jar, says that she has 'never written a character description', which is pretty much why I've written this blog post - published authors don't really seem to do it. She advocates conveying the character's personality through the things they say - how they 'speak, their mannerisms and gestures'. This is definitely a good starting point for an interesting sequence of key stage 2 writing teaching. Lisa also talks about how she just writes and the character appears - I'm not sure this would happen naturally with less experienced young writers. Author of both Bubble Boy and All The Things That Could Go Wrong, Stewart Foster, found, when writing his second book, that he got to know one of his main characters when he wrote (in first person) a letter (click here to see the letter in a Twitter thread from Stewart) from the boy to his brother. This would be an excellent exercise for children to undertake in order to help them think like the character would think. As in ATTTCGW this letter could be included as part of the narrative, making for a more varied and interesting text. Cosmic begins with Liam speaking (from space) a monologue to his parents - this is very similar in style to the letter. Victoria Williamson, the author of The Fox Girl And The White Gazelle, mentions the idea of sprinkling bits of description 'through the first few paragraphs or pages... so it's not just an info dump. She also mentions avoiding the use of any direct description, instead she chooses to point out similarities and differences between two characters in order to bring them to life. Perhaps a technique to try out with greater depth writers in upper key stage 2. As well as this Victoria suggests that writers can describe a character through another character's eyes, which works especially well when writing in first person. As she wrote in her guest post on my blog though, this can lead to a skewed perspective on 'reality' because characters see things only from their point of view. As we explored in our reading sessions on Cosmic we can often infer lots about character by the way they act and behave, particularly, as Tom Palmer (whose book Armistice Runner is published today) points out, the way they interact with other characters. This might include their gestures and stances as well as the things they say and do. I think that to help children to do this in their writing it might be useful to go back to a text and analyse how authors have done this themselves. Children could make a list of what a character does and make inferences about what this tells us about their character. Again, another skill perhaps for the children who write fluently already. In addition to this, more confident writers might want to use character description to signify something important in the story - a turning point in the plot, or to show how a main event has affected and changed a character. I can imagine teaching this to a small group and modelling how this might be done. Click here to read about how Tania Unsworth, author of The Girl Who Thought Her Mother Was A Mermaid, writes her characters. Tania Unsworth mentions many of the techniques already covered - her answer to my question would be a great one to study with the children. 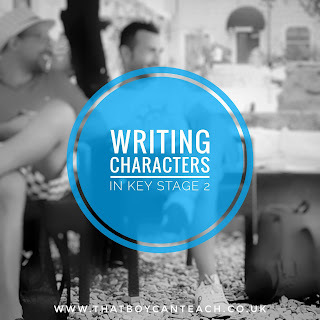 Hopefully our attempt to do something a little different, and the hugely helpful insights from the professionals might inspire one or two of you to try some new things out when you next teach characterisation. I'd love to hear from you if you've tried something like this before - please leave a comment here or on Twitter! Comprehension Strategies And The KS2 Reading Test - What and How Should We Teach?